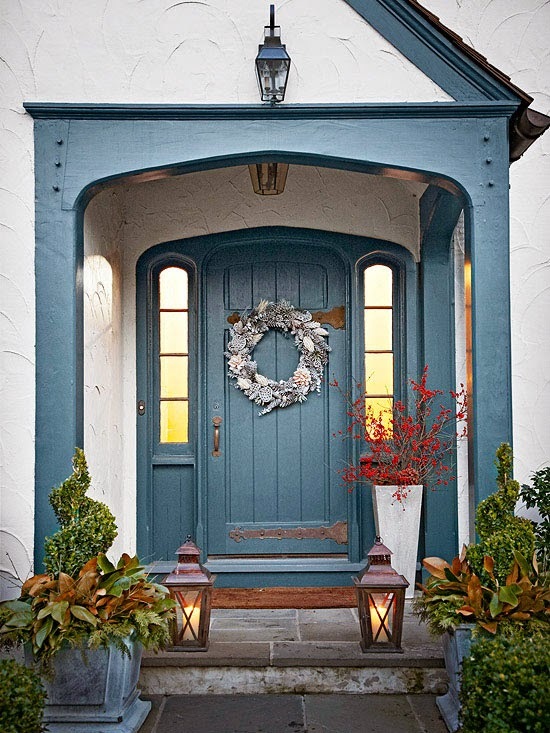 When in doubt, tradition is a good guide to selecting a front door that endures and offers curb appeal. Here, stylish side lights mimic the central front door. If the exterior of your home is painted or stained a darker color, consider a lighter door for a pop of brightness. For neutral-theme exteriors, play with bright and light hues to supply visual variety. On this home, a secondary glass door offers an added layer of protection from outside variations in temperature, but its design allows the simple beauty of this exterior door to shine. 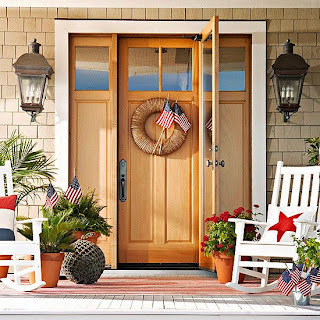 Like any other space on the outside of your home, your exterior doors—and the space around them—supply wonderful opportunities to accent your home's architecture and showcase your personal style. Case in point: the historic riff on this front facade. An aging technique on the front shutters and door offers vintage charm. But the pair also provides a secondary purpose. 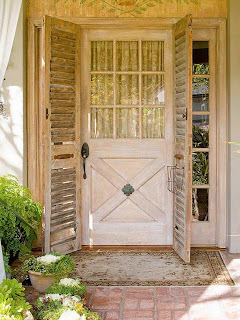 In warm weather the shutters are stand-ins for a traditional screen door. Up above, a delicate stenciling supplies pattern and a tiny hint of color. Other ideas for painted-on images include your family's last-name initial, a flower from a favorite plant, or detail picked up from exterior ornamentation. An exterior door needn't be bold and flashy to be a worthwhile design element. Take this traditionally influenced piece. A subdued hue—the first hint of the design restraint at work—picks up on the cool undertones in the home's gray-blue plaster work. Horizontal metal accents contribute to the classic feel, as do the matching side lights. For a pop of color on a mostly unostentatious setup such as this, turn to plants: Bright berries in a tall neutral vase add welcome contrast. 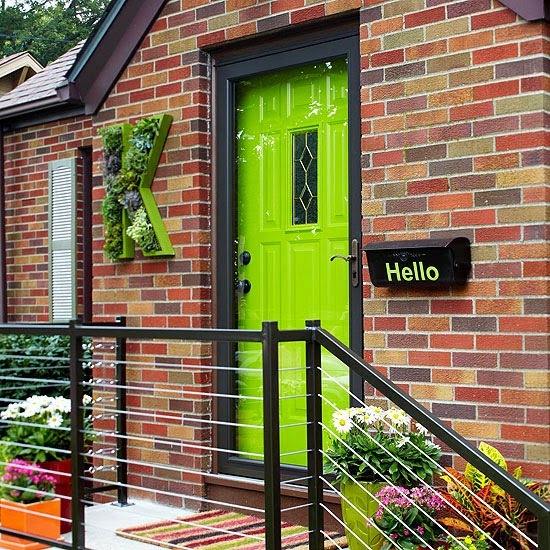 When it comes to brick homes, it's difficult to exact a drastic refashioning of the exterior color scheme—unless, of course, you use your exterior door to your advantage. 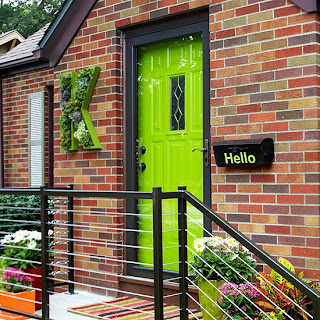 Take note here of the subtle green undertones in the brick patterning; that color cue was pushed to the edge of the bright and light spectrum with a bold lime green door and accents. To make the entryway feel finished, carry your color choice into everything including the outdoor rug and flower pot (and even a welcome on the mailbox).